One winter night, in 2010, I landed at the T3 terminus of Delhi airport. It was extremely cold; I needed a couple of pullover to keep myself warm and comfortable. Having missed out on few opportunities before, I really wanted to make this trip count. Immediately I contacted Junglelore, Mumbai and thanks to them within the next 2 hours our bookings were done. Only thing which was hovering around was “How to reach Ranthambore ?” Easiest way was to travel by train but you must be a very luck chap in India to get a train ticket for the same night. We knew it is going to be a Marathon night to reach Ranthambore; we decided to take a bus from Delhi-Jaipur and it was 2am again!! But, this time in Jaipur ! Managed our train tickets in the middle of the night from Jaipur-Sawai Madapur (Ranthambore). 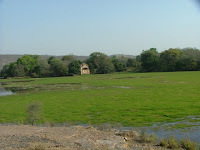 Now, we were rest assured to reach Ranthambore in the next couple of hours. Finally in Ranthambore. It was early morning 5.30 a.m. We were literally freezing while on an open Gypsy while going to the resort. People who had been to Rajasthan during peak winter will know the weather far better; Checked into the hotel and during winter mornings safari starts little late around 7am, so that gave us enough time to refresh ourselves and head for our first experience in the wild. 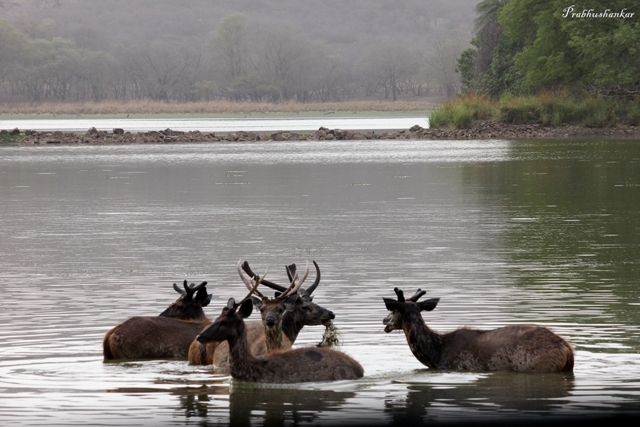 Ranthambore National Park has got five zones and adjoining Sawaimansingh park has zones 6, 7 & 8. 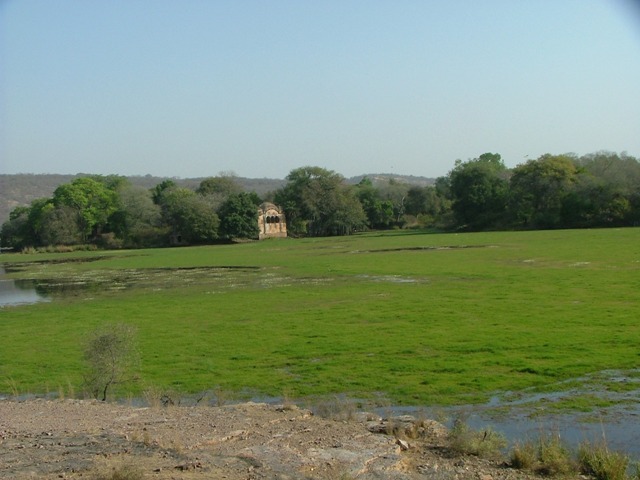 Sawaimansingh and Qualiji remains open for the tourist throughout the year but Ranthambore zones are closed during monsoon (July to September). 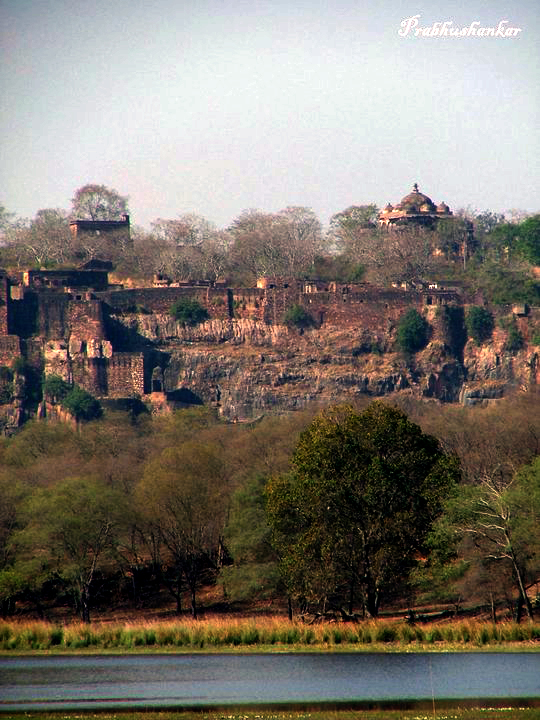 Ranthambore got its importance not only because of tigers but also from the fort. Ranthambore fort is considered one of the oldest forts in Rajasthan built 1000 years ago. There is also a Ganeshji’s Mandir, thousands of pilgrims visit it every year. Don’t be surprised if a tiger comes to see you in the fort. Now, we were heading towards Zone 3 which has the world-famous Rajbah Lake. This was previously a hunting ground for the Royal Maharajas of Jaipur. Our morning safari was with Raeez Bhai, one of the most passionate and knowledgeable drivers in Ranthambore. Even before we entered the jungle Raeez bhai’s information on forest and birds made things very interesting. We were close to Padam Lake in Zone 3, when a Sambar deer gave an alarm call sensing a predator. But soon the alarm calls disappeared and no signs of the big cats yet. As usual Raeez Bhai was doing his best to show us the tiger. More than couple of hours into the safari, we were returning to Rajbah after a brief visit to Mandook area without any luck. Though, we didn’t see a tiger his stories and knowledge on the jungle made us more than happy. Just before Rajbah there were vehicles queuing up. Alarm calls again, though this time it was a continuous call. We were in all hopes that a tiger sighting is for sure. Suddenly the shutterbugs were on full force and yes it was the beautiful Stara (T- 17), one of the most dominant tigers in the park. She was walking from quite a distance and slowly came towards us. She happens to be the Queen of Rajbah Lake. 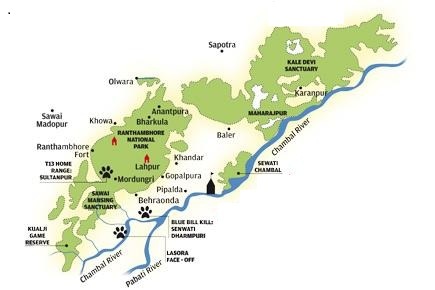 This particular territory is considered one of the best tiger habitats in the world. Because the lake has water throughout the year and prey base is also extremely good. 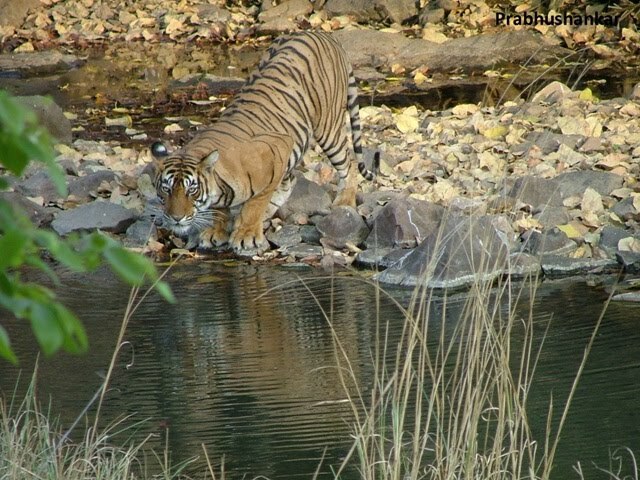 It’s always special to see your first tiger in the wild that too at Rajbah. T-17 took over this territory from her mother the world-famous tigress Machili (T-16). Not long ago Machili, popularly known as “Lady of the lakes” was awarded with the Lifetime Achievement Award. 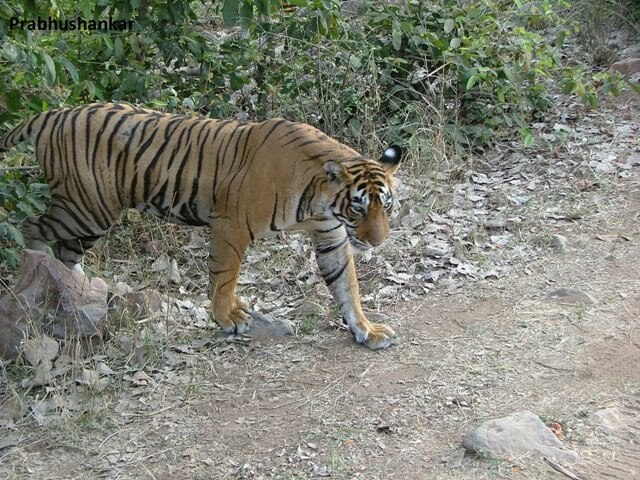 She is one of the most photographed tigers in the world and has given 9 tigers to Ranthambore. T-17 was one the three cubs from the last litter of Machili. Evening safari was even more special, when we saw Tigress(T-19) sister of T-17 chasing a wild boar in the Zone II near Nalgati area. 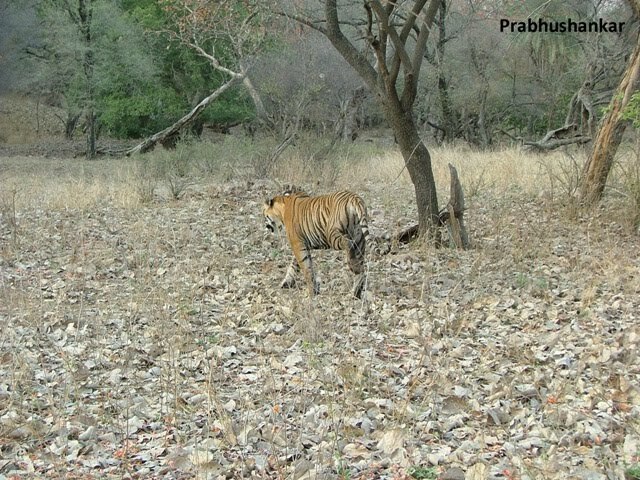 Though a tiger takes several attempts before making a successful kill, we all wished she could get him. It was unfortunate for the tiger but fortunate for the piglet that she wasn’t able to cling on to him. One should be lucky to see a tiger in the wild but to see a live kill you must be extremely lucky. This particular incident turned me from a regular tourist to a wildlife enthusiast. 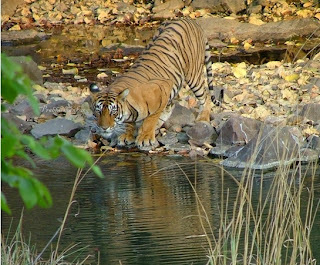 Then on, I have visited Ranthambore and various other National Parks and Wildlife Sanctuaries across India on several occasions. Each time I have seen something different and interesting but more importantly I got to learn a lot about the jungle and wildlife from the experts of those areas. A piece of advice to people who plan their vacations in any wildlife or jungle related places, is not to disturb the jungle by any means. Never litter and tease or feed wild animals. This might create unnecessary trouble for you and also for the wildlife. 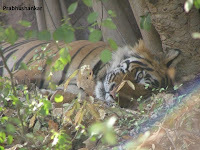 One happy news before I end, the Tigresses I saw during my first visit to the park have given birth to cubs. T19 gave birth to 3 cubs last year and T17 was sighted with 3 cubs this year on the penultimate day before the closure of the park due to monsoons. I was fortunate to see the cubs of T19 last month and hoping to see T17’s cubs post monsoon. 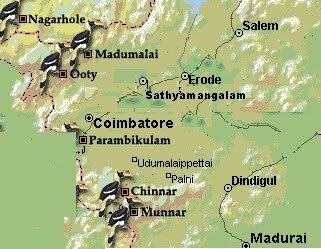 Great news for people of Western Tamil Nadu!!! The place known for its Elephant habitat is in a new era . 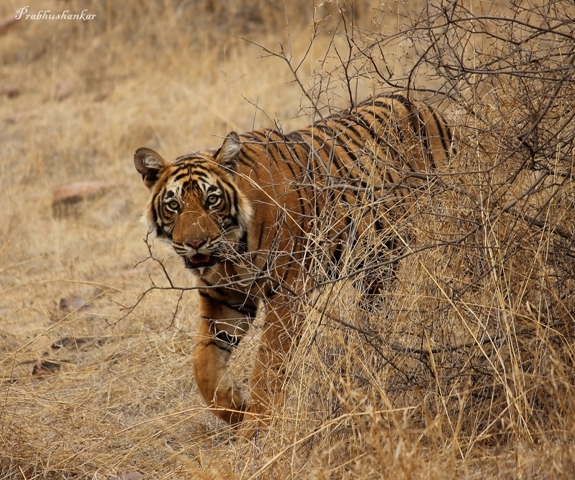 Recently published reports suggest that there is a sharp increase in tiger sightings from Sathyamangalam range. Kovai jungles are no exception. The big cat on prowl was captured on a camera in the Sirumugai range last week. This comes as the first visual evidence of the presence of Tiger in this range. The place once called “Land of Veerapan” has turned into tiger’s paradise now. 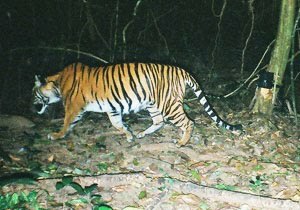 The camera traps placed at 30 different places at Moyar valley in Sathyamangalam forest have captured 19 different tigers and DNA analysis of scats have also confirmed the presence of at least 13 big cats. 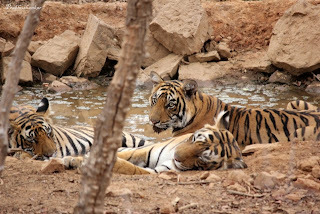 During a census (for 6 days) last year, 5 tigers were sighted directly by the officials at Hasanur and Bhavanisagar which falls under Sathyamangalam range. Sathyamangalam is spread across 524 sq km has got a strong prey base which accounts for the increase of tigers in this area. The forests around Coimbatore are also no mark with prey population. Spreading across 69,000 hectares the Coimbatore forests have started attracting the tigers from adjoining forests like Sathyamangalam and Mudumalai. This shows tiger’s future is secure in the jungles of TamilNadu. This is a great news to the tiger community and to the audience around India. Hope we get to see an increase in the tiger population this year too!! It’s always a pleasure to visit “The Tiger Paradise”. 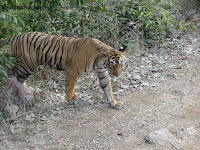 Hopes to see the big cats are always on the high at Ranthambore National Park. Without big surprises we were given a Royal welcome. In the first few minutes of the opening safari “The King” was there to welcome us. 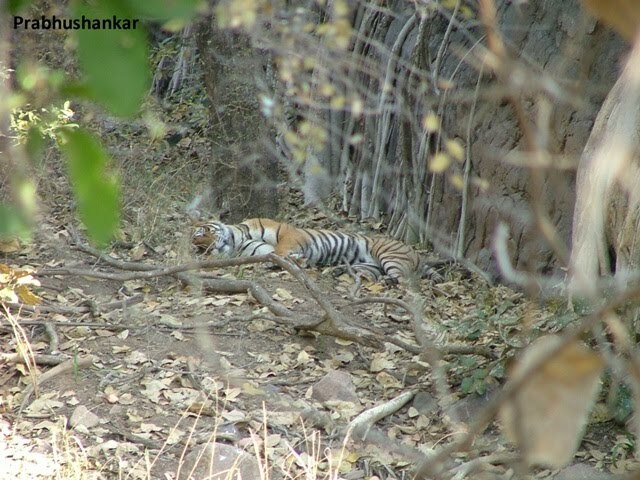 T24 male was resting in the shade of a rock near the Phuta Khor region in Zone II. We approached closer to him and were just few yards away. 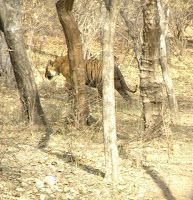 This happened to be my first sighting of a male tiger at Ranthambore. He opened his eyes and gave a quick stare then silently went back to sleep. The new couples in the park were T24 and T39. Hence we knew she should be somewhere in the vicinity. Soon we got news that she was sighted at Magarde not very far from Phuta khor. We rushed to that spot and found her taking a well deserved rest under the shades of the tree. There was news that T19 was sighted near Nalghati but we preferred to stay at Magarde to get a closer and personal look at the beautiful lady T39. We waited for an hour, finally our patience paid off. She got up and walked towards the water hole, drank water, soaked herself in the water and crossed our vehicle with feisty. She was so close to us that a stretching arm from our jeep could easily reach her. We rushed closer to the other side of the road to catch a second glimpse of her royal walk. She appeared through the woods and looked extremely gorgeous. The shutterbugs were in full force to catch this beautiful female. She quietly walked from the woods towards us and crossed our vehicle yet again. This time she was even nearer to us. Courtesy her we got some wonderful pictures in the wild. What better one could hope for in the first safari itself? After a satisfactory day one it was full of highs and lows in the remaining days. 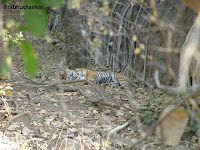 On second day morning safari we saw one of Machli’s dominant litters T17 (Sundari) at Rajbagh. Tough she was quite a distance away yet we were able to get a good glimpse of her through the binoculars. For us it did turn out to be a comparatively dry day, but for those lucky lots who made it to Zone III in the evening it turned out to be a bonanza.. Crocodile and Tiger (T17) were fighting for their food and sambar deer fighting for its life at The Rajbagh Lake. 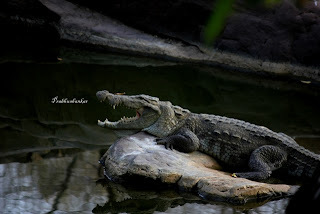 Crocodile was trying to drag the sambar into the water and T17 tried to pull it away. T17 being the daughter of Machli wasn’t as competitive as her mother. Crocodile won the battle at last. But for the lucky ones around it was an unforgettable experience. The final day turned out to be a mixed basket. For the first couple of hours nothing really happened. We went near Machli’s territory but wasn’t lucky enough to see her. Towards the end of the safari saw a jackal. While turning to the entry point near Tamba Khan there were vehicles lining up. And yes it was dollar male T25. He was soaking himself in the water. Within next few minutes he disappeared into the jungle. But even better news was waiting as we entered the resort. 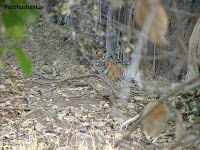 T-8 with two cubs was sighted in Sawai Man Singh Sanctuary adjoining Ranthambhore National Park. This was (and is) great news for the Park and the wildlife enthusiasts.Kudos to Ranthambore!! Hoping to see you again later this month!!! Not long back there was delight among Tiger lovers. 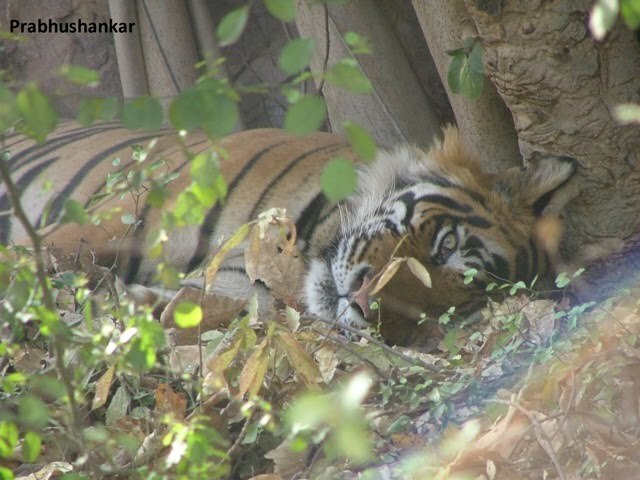 11 new cubs born to T-5,T-21,T-13 and T-31 were sighted at Ranthambore national park. The glee has taken a little pounding after the recent news. First T-13’s venturing out of the park with her cubs. This might have been to safe guard the cubs from the dominant males near her Sultanpur territory. Some time back she was found in a confrontation with star male T-28, this might have given rise to the unsafe environment for the cubs. Air lifting of cubs father T-12 to Sariska didn’t help either. 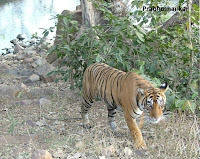 Recently, she has been sighted near the Chambal River along with her cubs. She is not successful in crossing the river since the cubs are too young for this. But the worst is T-13 who brought up T-38 and T-39, must safe guard herself and the cubs from the hands of the poachers now. There has been a continuing story that tigers fromThen loss of T-5 came as a very big disappointment. She was badly wounded and didn’t really recover after that. The injuries might have been due to a conflict with tigress T-17. Minor surgery was done on the wound a few days back but still surgery couldn’t save her. T-5’s cubs are still in the forest but its extremely difficult for them to survive as they are too young to hunt for their food. Hope the forest department can take these cubs in at the earliest and bring them up like what they did to T-36 and T-37 cubs of the Guda female. It seems these cubs will be moved to Sariska but not before couple of years under the watchful eyes of the forest officials. The other incident was T-26 venturing out of the park a week ago. Not long before she was sighted along with 3 of her cubs in the Indala region of the park. 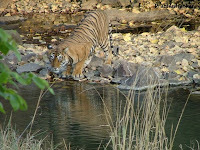 Ranthambore are straying out frequently. Male tiger T-38 has found a new home for himself at Madhya pradesh’s Kuno-Palpur sanctuary. He strayed out of the park six months ago and travelled nearly 100km to reach his new home. Experts believe he will further move towards Madho National Park since there are no tigress’s at Kuno-Palpur. Another male Tiger T-7 has travelled 200km to reach Bharatpur. 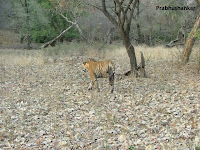 But the process of relocating him to Sariska national park is already underway. 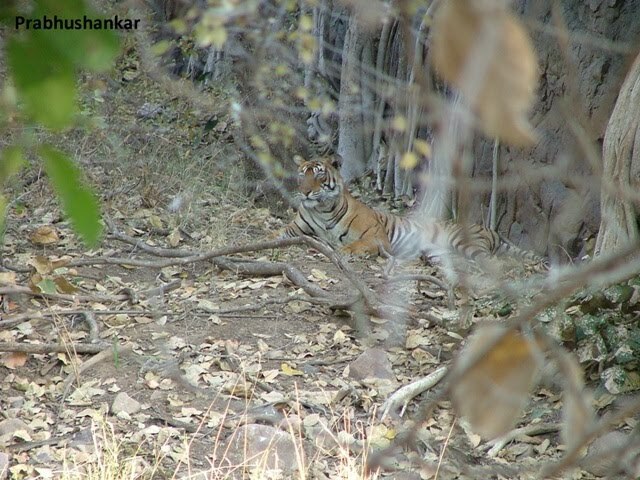 These suggest that the tiger population in the park is growing and space constraint has become a major issue. Some tigers have ventured out to find territory for themselves outside the park. It’s left to the authorities now to monitor and draw up some specific plans to help these big cats.